What are Infinity Corrected Optics? 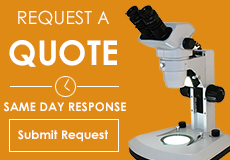 Before Infinity corrected objectives were introduced about a decade ago, all microscopes had a fixed tube length. Microscopes that do not utilitze an infinity corrected optical system have a specified tube length - that is, a set distance from the nosepiece where the objective is attached to the point where the ocular sits in the eyetube. The Royal Microscopical Society standardized microscope tube length at 160mm during the nineteenth century and this standard was accepted for over 100 years. 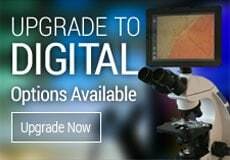 When optical accessories such as a vertical illuminator or a polarizing accessory are added into the light path of a fixed tube length microscope the once perfectly corrected optical system now has an effective tube length greater than 160mm. In order to adjust for the change in tube length manufacturers were forced to place additional optical elements into the accessories in order to re-establish the 160mm tube length. This usually resulted in increased magnification and reduced light. German microscope manufacturer Reichert started experimenting with Infinity corrected optical systems in the 1930s and were followed later by Zeiss and Leica. However, the infinity optical system did not become common place until the 1980s. Infinity corrected optical systems are used in research laboratory microscopes and industrial metallurgical microscopes. These microscope systems have an image distance that is set to infinity. A tube lens is placed within the body tube between the objective and the eyepieces to produce the intermediate image. The Infinity optical system allows auxiliary components (such as illuminators, polarizers, etc.) to be added into the parallel optical path between the objective and the tube lens with only a minimal effect on focus. 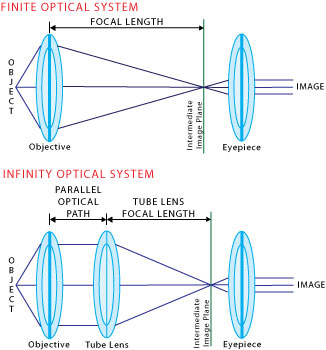 The tube length in infinity corrected optical systems (also known as the focal length) ranges from 160 - 200mm. Meiji, Leica and Nikon all have a focal length of 200mm, Olympus uses 180mm, and Zeiss 165mm. The space between the objective and the tube lens (shown in the image above labelled as "Parallel optical path") can be referred to as Infinity Space and provides a path of parallel light where optical components can be placed without the introduction of spherical aberration or modification of the objective's working distance. One benefit in using Infinity Corrected Optics is that parfocality between different objectives can still be maintained, even when one or more auxiliary components (such as illuminators or polarizers) are added into the optical path. Another benefit of the Infinity Space is that accessories can be created to produce exactly 1x magnification without altering the alignment between the objective and tube lens. This allows the user to compare specimens using a combination of optical techniques, such as phase contrast. This works because when the optical accessories are placed within that "Infinity Space" they do not shift the location or the focal point of the image. The term "Infinity Optics" actually refers to the production of a flux of parallel light rays after passing through the objective. It would seem that the term refers to the Infinite Space in the microscope for adding additional components, but this is not the true definition.